RTI Race 2017 in association with Cloudy Bay. 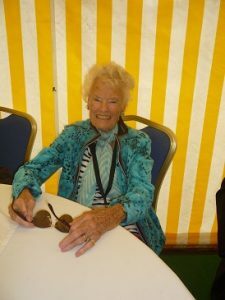 At the press conference to herald this year’s RTI Race it was announced that Eva Branson (mother of Richard) would start this year’s event. With the first start at 5. 30am she certainly needed an early call. Mark Wynter, Commodore of the ISC referred to the 25 starters in the inaugural race in 1931, compared to this year’s 1342 entries of which there were 1221 finishers. Calling the contest “A race for All” he regretted not being able to take part himself. Citing last year’s sinking of his own boat ‘Alchemist’ he remarked “I wasn’t sailing her!” but added “it was a racing incident and I have forgiven the skipper.” Mark also said that he now had a replacement yacht and looked forward to being in contention again next year. 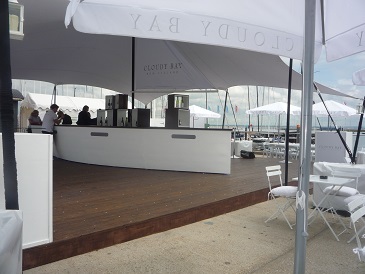 With New Zealand having recently won the America’s Cup perhaps it was appropriate that New Zealand wine brand Cloudy Bay was the associate sponsor of this year’s RTI Race. Cloudy Bay already sponsor the J Class Association and this year began the initial two-year sponsorship of the RTI Race. Several sailors from the many thousands taking part were selected to share their hopes for the race. Twins Charlotte and Milly Boyle (16) entered in the J70 ‘Rita’ along with Vita Heathcote (15) and her dad George. This trio of girls are currently in the British Youth Sailing Squad. Lymington based adventurer Neil McGrigor was aboard his J109 ‘Boo’. Last year he recorded a 3rd in class despite a MOB incident. He insisted this year’s attempt would be a family affair with his wife, twins and cousins on board. 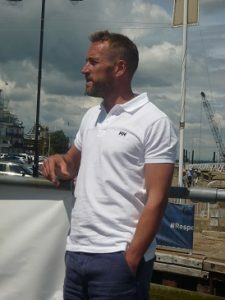 Another adventurer taking part was TV personality and writer Ben Fogle, a Cloudy Bay Brand Ambassador. Frank Fletcher CEO of the Ellen McArthur Trust outlined the Trust’s four entries and referred to ‘Moonspray’s Round Britain Trip which started from the trust’s second base in Largs. Raising awareness of and funds for the trust, ‘Moonspray’ is currently heading down the North Sea coast towards London where she will sail under Tower Bridge before heading for the South Coast. As well as the Ellen MacArthur Trust yachts, other boats compete in the RTI in support of charities. One boat from Italy had disabled sailors on board. Ricado Mazzetti from Trieste has been in a wheelchair for about 10 years but as a keen sailor before his accident realised it was a sport that he could still undertake despite his disability. Notable winners of the Gold Roman Bowl over the years include Sir Max Aitken, Rt. Hon. Edward Heath, Cowes resident Peter Morton and Jeremy Rogers. 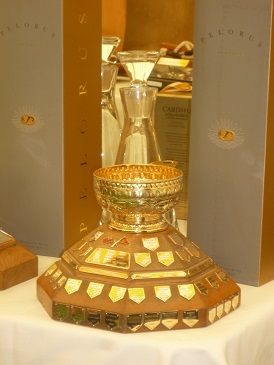 After a record breaking race with plenty of excitement The Gold Roman Bowl and a Cloudy Bay Decanter were awarded to – O/A IRC- GBR4863R YES! Adam Gosling. At the prizegiving Adam thanked the organisers of the race- Island Sailing Club, sponsors and helpers. Presenting the trophies and other prizes were Sir Keith Mills, Chairman of the Royal Foundation, Founding Director of Land Rover Ben Ainslie Racing and winner of the Gold Roman Bowl in 2013 alongside Cloudy Bay’s Senior Brand Manager Maria Ines Pina and the Race PRO Mike Peskett. 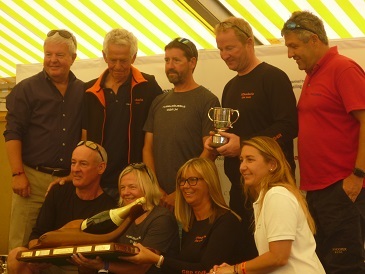 Saturday’s race saw the well-deserved record-breaking rounding in 2hrs 22mins 23secs by the MOD70 Concise 10 (Ned Collier Wakefield) to secure Multihull Line Honours and win the GOLDEN MILLER CHALLENGE CUP – Overall Winner GP/MOCRA M’hull, DEAN & REDDYHOFF TROPHY – 1st Multihull GP on corrected time and FREEDOM CHALLENGE BOWL – First GP/MOCRA Multihull to finish. Highland Fling XI (Irvine Laidlaw) secured Monohull Line Honours in 4hrs 19mins 44secs winning the OBSERVER TROPHY & DECANTER – First Monohull to finish and the SILVER ROMAN BOWL & CLOUDY BAY DECANTER – Second O/A IRC. 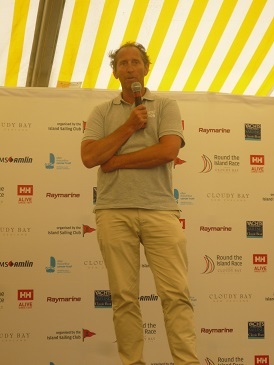 Cloudy Bay Brand Ambassador Ben Fogle sailed on the Farr 52 Bob by Cloudy Bay which was 18th over the line after a great race that took them 6hrs 11mins 3secs. and ELEPHANT TROPHY – First Quarter Tonner- FRA7891 BULLIT Louise Morton. 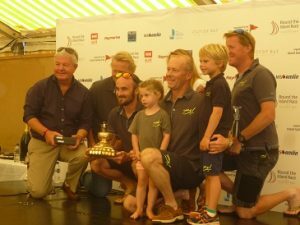 As well as handing out the trophies Sir Keith Mills was presented with the FAST40+ CLOUDY BAY TROPHY – First Fast 40+ on corrected time (GBR1851X INVICTUS). Helmed by Keith and his son Alex, INVICTUS took Line Honours for the FAST40+ Class, and the class win. In an epic race around the Isle of Wight, nine FAST40+ teams finished within just 18 minutes of each other, after a six-hour duel around the course – the class lead changing hands on numerous occasions. Next year’s race will take place on 23rd June- coinciding with the new date for the IW Festival!